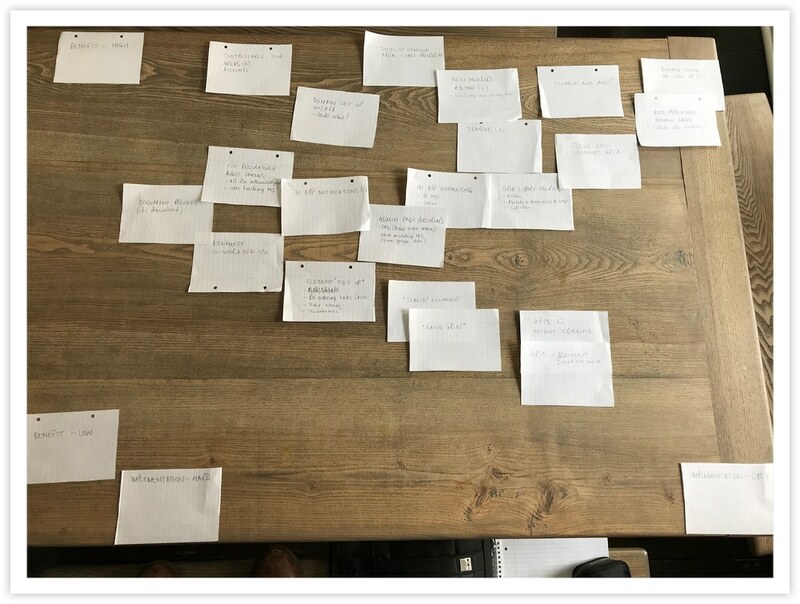 At a recent out-of-office team summit (July 2018), we spent a good portion of our time discussing and planning the new features we want to introduce into Method Grid: our new feature roadmap. What do you (our community of users) want? We are always asking for user feedback – specifically what features you would like to see in the future that would accentuate the impact Method Grid has on your business. Fortunately, our community is not shy in making these requests known! We took all this feedback and drew up one big list of features our users really want to see. What does the Method Grid team want? We are users of Method Grid too! So we asked ourselves what features we think would take the platform to the next level of utility for us. As to be expected, this was in significant harmony with the community wish list. How should we prioritize the development of these new features? Finally, we prioritised this list of features, using a two-by-two matrix – based on two variables: (a) user benefit (low/high); and (b) the development complexity/challenge (low/high). 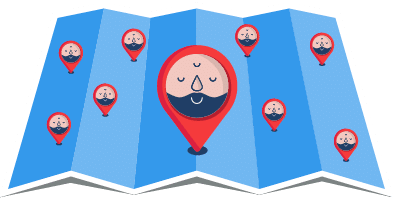 Search – we want to make it much easier for you to quickly find a relevant asset within your platform (starting with grids, members, elements and templates) with a simple search function. 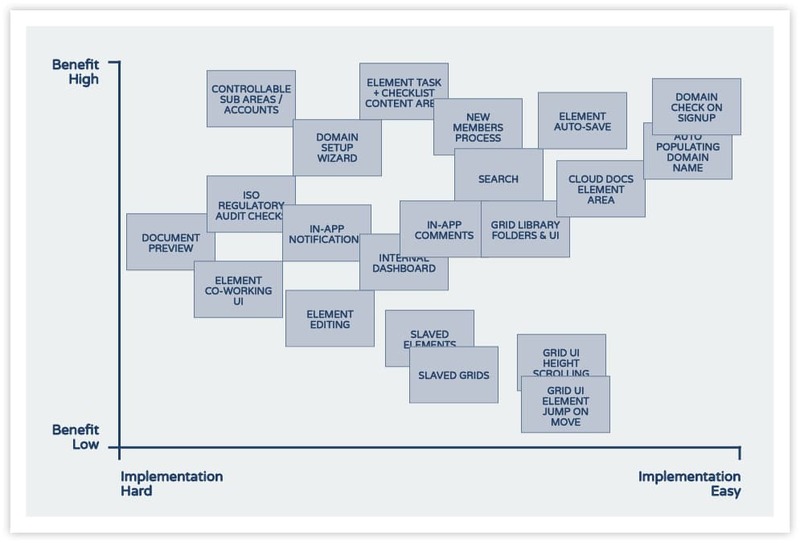 Grid UI (user interface) – we want to improve the way the grid interface works. Grid element drag/drop – we want to improve the way you drag/drop elements within your grids. Element task checklists – one of the most requested features is the ability to add a task checklist content area within an element. This, in turn, opens up a really exciting aspect of the future Method Grid: the ability to clone master methodologies into specific instances of actual delivery. In these actual delivery instances, users can progress-tick their way through completion of an overall grid. This exciting new feature will allow for powerful summary views. For example, elements containing task checklists will display progress display bars at the summary grid level. Users will also be able to configure such elements to turn a new colour when all tasks completed – thus allowing for engaging summary grid displays. In-app commenting – introduces the ability to message @ members (received via email and in-app). This to facilitate collaborative IP creation and allow for all members to make suggestions and comments to targeted colleagues. Setup wizard – we want to make the initial setup of a new Method Grid account much easier – guiding new users through a logical approach. Element editing – we want to improve how you control and edit some existing element areas e.g. re-ordering/editing documents and links. Controllable sub areas/accounts – this is another highly requested feature. We want to provide a granular access control system for your Method Grid domain so you can set which members can see certain grids. This new feature will include the ability to add guest users to your domain (with restricted access). ISO regulatory audit checks – a number of our users are working to heavily-regulated procedures (that requires them to formally validate that procedural updates are acknowledged by all). For these users, we want to introduce audit checks for grids and elements i.e. to allow account architects to see when new, or updated, content has been accessed, and acknowledged, by account members. Master/slave grids and elements – this feature will allow grids to be logically linked such that if an element is updated in a master grid, this is pushed down (automatically) to all linked slave grids. Now the really important bit – have we got this right, what do you think? Jody Van Vestraut is a co-founder of Method Grid (a platform on which to design, build and share your methodologies and procedures). He's a technical marketing consultant and front end web developer (a two-headed beast).